A mobile phone application aimed at empowering civilians to hold law enforcement accountable has been re-launched in California amid a growing nationwide debate on policing tactics amplified by recent officer-involved incidents-turned-deadly. 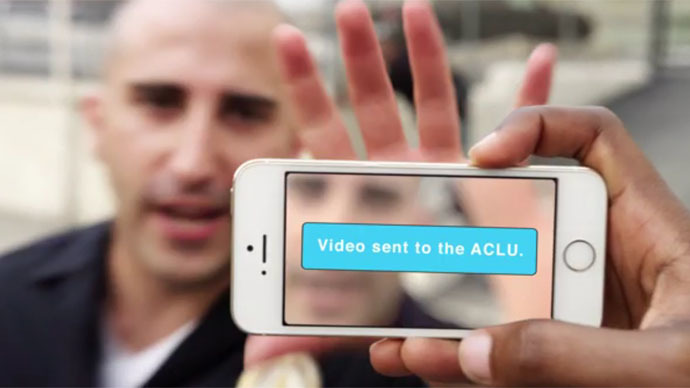 The free “Mobile Justice CA” app released by the American Civil Liberties Union this week is an easy-to-use program that instantly records video with a single touch of the screen and then offers the user the option to send that footage automatically to the ACLU with another. Specifically, the ACLU says the app is a response to over-policing, racial profiling and excessive use of force – topics that have all taken center-stage in recent weeks after Freddie Gray, a 25-year-old black man from Baltimore, died from injuries sustained while in police custody. “Video images have clearly become a powerful tool in documenting encounters between the public and police. The ACLU of California wants to make it more likely that even more individuals will use their phones to record those incidents, enabling the public to hold officers accountable when they cross the line,” said Hector Villagra, the executive director of the ACLU of Southern California. “We’ve seen a number of examples of high-profile incidents of abuse and unlawful shootings or killings that never would have come to light if someone wouldn’t have pulled out their phone and taken video,” Peter Bibring, a senior staff attorney at the office, told the Los Angeles Times. “Video doesn't always capture everything, but it does provide a much more objective evidence of what actually happened,” he said. Modeled after previous version geared towards smart phone owners in New York, Missouri and Nebraska, Mobile Justice CA is a Golden State-specific edition from the ACLU’s California branch that instantly sends the recording to the local office of the user’s choice. The app appeared in Apple’s iTunes store on Saturday, and was updated on Monday ahead of the ACLU’s official unveiling on Thursday this week. A version for Android users is also available on Google Play. Bibring, the senior staff attorney, recalled to the Times an issue from earlier in April when a woman in South Gate, California had her recording device snatched and then smashed by a United States Marshal as she tried to tape police activity. A neighbor managed to capture the encounter from their own device, and that footage has been viewed on YouTube more than 1.5 million times in the week since. “The right to film police is clearly established and even so, we see incidents like that,” Bibring said. Indeed, federal officials announced on Tuesday this week that a cop across the country in Buffalo, New York has been charged with two counts of deprivation of civil rights after he allegedly beat a person in police custody. According to the Federal Bureau of Investigation, one of two supposed instances was captured by a witness but was deleted from their cell phone upon the demand of another officer. Additionally, the app also provides a feature which, when enabled, broadcasts the location of the person who is recording so that others in the area can stay alert for suspicious activity. Coupled with functionality that lets users quickly capture police activity and instantly share it with civil rights experts, the ACLU hopes the app will help citizens hold officials accountable by making it easier to get it into the hands of others. “People who historically have had very little power in the face of law enforcement now have this tool to reclaim their power and dignity,” Patrisse Cullors, the director of the Truth and Reinvestment Campaign at the Ella Baker Center for Human Rights, said on Thursday. “Our vision is that this app will ultimately help community members connect and organize to respond to incidents of law enforcement violence, and then share their experiences and knowledge with others,” Cullors said. The April 12 arrest of Freddie Gray in Baltimore and his subsequent death is currently under review. In North Carolina, meanwhile, former police officer Michael Slager remains in custody after being charged with murder after he fired eight shots at a black man who fled following a traffic stop earlier in the month. Slager was working with the North Charleston Police Dept. at the time of the incident, and eyewitness footage of the altercation was instrumental in propelling awareness of the case and bringing charges against the officer.